GigE (Gigabit Ethernet) cameras are imaging cameras that are connected to computer systems using GigE ports. They follow the GigE Vision interface standard that was mainly developed for the industrial cameras. These cameras are used in applications that require high speed and high resolution image processing as well as multiple cameras. These cameras can be deployed using standard low cost network components and long cable lengths, enabling them to be used in locations far away from a dedicated computer. Gigabit Ethernet Technology puts no restriction to the number of interfaced devices, hence allowing a large number of networked imaging cameras to effectively function within an environment. The report study includes the demand of this particular market on a global and regional scale for a five-year period of 2016-2021, both in terms of volume (Units) and revenue ($Million). The market is evaluated based on the key attributes such as the power in the hands of producers and consumers, analysis on the degree of competition, and threats from substitutes and new entrants. The report also incorporates segmentation based on types, image sensors, spectrum, resolution, application and end user industries. Types of GigE cameras include Area Scan, Line scan, Traffic and Thermal Cameras. These cameras can be categorized on a variety of image sensors such as Complementary Metal-Oxide-Semiconductor (CMOS), Charge Coupled Device (CCD) and so on. Progressive Scan CMOS is a type of Complementary Metal-Oxide-Semiconductor (CMOS) sensor technology. Progressive Scan CCD and Interlaced CCD are the two types of Charge Coupled Device (CCD) sensor technology. The GigE Camera market can be segmented based on the spectrum such as Monochrome Camera, Color Camera, Near Infrared (NIR) Cameras and Ultraviolet (UV) Cameras. The major applications of GigE camera are Industrial, Machine Vision, Security and Surveillance, Research and Development, Night Vision, Robots, Factory Automation, Electronics Manufacturing and many others. The market has also be classified based on various end user industries such as Automotive and Transportation, Defense, Pharmaceutical and Cosmetics, Food and Packaging, Manufacturing, Electronics and Semiconductors, Printing and Medical industry and so on. The GigE camera market has also been segmented based on geographical region: Americas, Europe, Asia-pacific and Middle-East & Africa. These geographies are further classified into countries holding prominent share in the GigE camera market for the forecast period. Major market revenue share is contributed by the U.S and Canada. 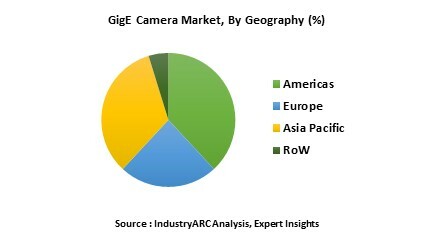 Americas is the dominant region for GigE Camera market with U.S and Canada leading the global market. Asia-Pacific is projected to have highest growth in the next few years on the back of innovations attained in the smart Camera technology thus playing an important role in future intelligent video surveillance system. Competitive landscape for each of the product types is highlighted and market players are profiled with attributes of company overview, financial overview, business strategies, product portfolio and recent developments. Market shares of the key players for 2015 are provided. Drivers, challenges and constraints which control the profitability of an industry is also analyze in the report.